Carolan took a trip down to London, to the Digital Economy Research Showcase event at Digital Shoreditch where it got to meet the computer geeks (rather than the guitar geeks). 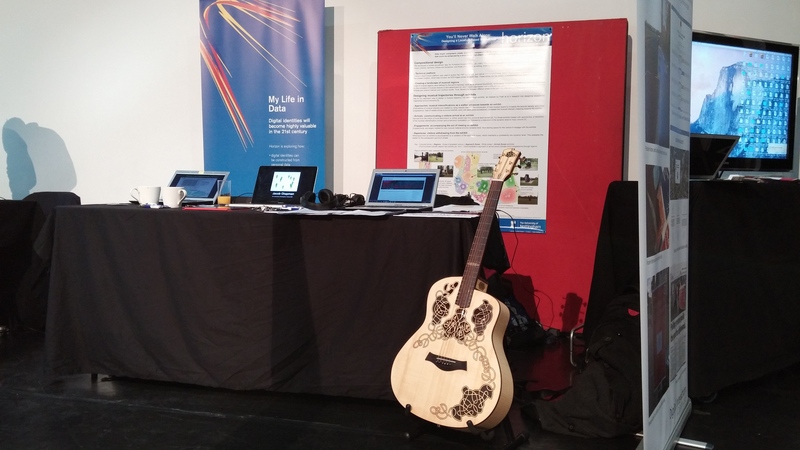 This was an opportunity for the team to display, discuss and gather views from other researchers and computing industry professionals about the wider concept of the Carolan Guitar project. Understandably, Carolan was a talking point at the event and plenty of attendees wanted to look, touch and talk about the guitar, although nobody played it! There were animated discussions around the guitar and related concepts. Some had their interest sparked by the Aestheticodes concept, who immediately saw other opportunities for their use; others wanted to know how the guitar was made and the use of materials; whereas some critiqued the technical requirements of the mobile application. Even though the majority of people were not guitarists, Carolan’s presence prompted a number of ‘guitar’ stories; such as those who recounted, with sadness, their brief flirtations with a guitar bought for them when younger, to an intriguing story about a guitar repairer removing the pick-ups from a client’s Gibson Les Paul to discover an old note underneath them with the name ‘Jimi’ written on it and an old style London telephone number! Whether the ‘Jimi’ from the story was a Hendrix or actually Jimi Smith an electrician who used to live off the Mile End Road does not really matter, stories such as these are pervasive and they are shared with mutual interest and reverence, even at an academic event populated with non-musicians.